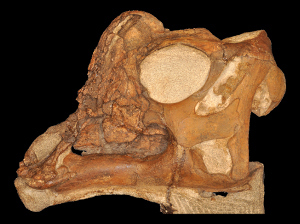 The skull of “Joe” is remarkably complete, even if it was split into left and right halves by erosion. This split is fortuitous in some ways, exposing structures on the inside of the skull that would otherwise be inaccessible. For a tour of the skull, check out the video below. Or, you can explore the fossil and reconstructed skulls in 3D.